Known as a leader in New Pulp Fantasy, Pro Se Productions announces the release of Author Don Thomas’ first fantasy novel. Thrill to excitement, intrigue, and magic as two men discover what it means to be THE BROTHERS JADE. Pro Se Productions presents THE BROTHERS JADE, an exciting tale of fantasy and magic by Don Thomas. Set on the landscape of his own imagination, Thomas creates a cast of characters that not only stand sword to shield with other fantasy creations, but also carry humanity in their every action. In THE BROTHERS JADE, The world of Mythas is in transition. The old gods are near forgotten and a palpable tension hangs in the air. This is especially apparent to two young magic casting brothers, Lawrence and Hesikiah, raised by a father who was a War Mage of the highest caliber and a mother whose shrewd diplomacy helped to forge the alliances of the five great nations to the West. Even with a lineage such as this, neither brother could have imagined the role they and the other valiant heroes soon to join them would play on the world stage. Or that their coming had been foretold in a series of ancient prophecies. THE BROTHERS JADE is as much a story of family and heroism and loyalty as it is of monsters, mages, and battle. Both a quest tale and a rousing adventure, THE BROTHERS JADE brings out another aspect that is often overlooked in Fantasy works. It is also a coming of age tale sat against the stark backdrop of intrigue and adventure, action and danger. An action packed novel for any fan of Fantasy. Featuring a cover by Adam Shaw with cover and logo design by Percival Constantine, THE BROTHERS JADE, formatted for print by Constantine, is available on Amazon and at www.prose-press.com for $12.00. The novel is also available as an Ebook, formatted and designed by Russ Anderson, at Amazon, Barnes and Noble, and www.smashwords.com for only $2.99. THE BROTHERS JADE by Don Thomas from Pro Se Productions, the leader in New Pulp and Genre Fiction. For interviews with the author or for digital review copies or more information on THE BROTHERS JADE, contact Morgan Minor, Pro Se’s Director of Corporate Operations, at MorganMinorProSe@yahoo.com. Don Thomas is a writer and editor. During his time with Pro Se Don has worked as a copy editor, as well as having the fantasy short stories Andar and the Farmer and the Town that Demanded Recompense published in different anthology volumes. Don was also able to publish a Science Fiction novel titled Savior in early 2012. One of his proudest achievements with the company was being able to work on several Pro Se Pulp Obscura projects including The New Adventurers of the Griffon and The New Adventures of the Green Ghost, as well as the upcoming Pulp Obscura book featuring Major Lacy. 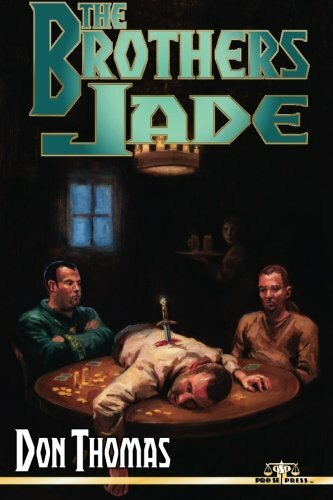 THE BROTHERS JADE is Don’s first fantasy novel. He is also working on several other Fantasy projects including an anthology and other novels set in the same Fantasy setting as the first. Along the way he has also been steadily working on completing a novel based on his 1940's Pulp character the Rapier, which will also be featured in an ongoing monthly comic by another publisher.